Persistent Median Artery with Bifid Median Nerve. Findings- The thickened and edematous median nerve is bifid and split by a vessel in the carpal tunnel. Doppler correlation confirms it to be the persistent median artery. Discussion- The median artery provides blood supply to the forearm and the hand during embryonic development. As the radial and ulnar arteries develop, the median artery atrophies to a small vessel accompanying the median nerve in the forearm. However, median artery can persist in a smaller subset of people. 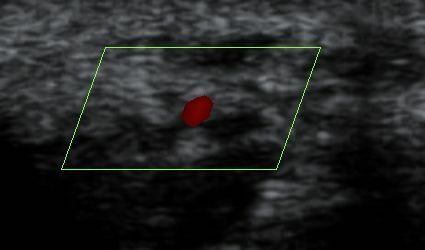 When extending into the carpal tunnel, a PMA may join the superficial volar arch,may supply the radial digits with an absent arch,or may end as a thrombosed thread. An enlarged, thrombosed, or calcified PMA and a PMA aneurysm in the carpal tunnel were considered causes for Carpal tunnel syndrome in studies by Eversmann and Barfred et al. MRI is useful for identifying a persistent artery or vein within the carpal tunnel. This is as well an important observation to avoid injury to the vessel at surgery.